Livingreen Design offer a full bespoke design and build service to specifiers. With professional product designers on our team, we can take a sketched idea and using our CAD facility provide you with drawings and 3D models for approval prior to manufacture in Advanced Composites, metals, wood or any combination of these as required. Any size and finish can be supplied, with AC particularly suitable for roof gardens or anywhere where weight is an issue. Lighting can be easily incorporated as can logos and dates. 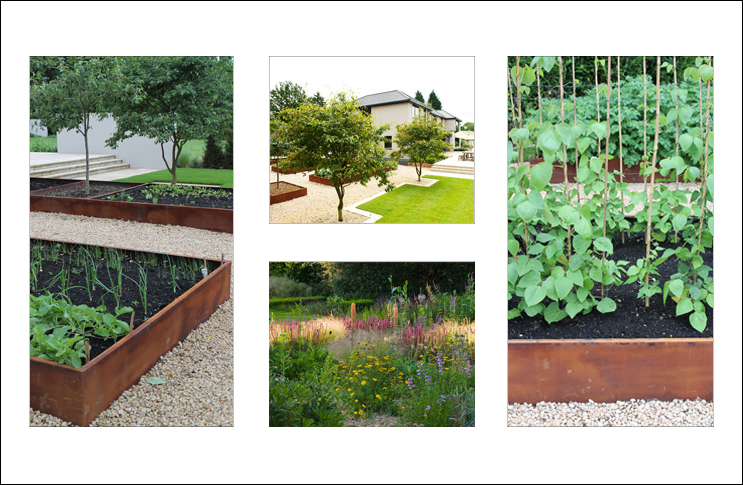 We were asked by a local Garden Design company in Edinburgh, Twig Garden Design, to help them create a set of bespoke corten steel effect planting beds. 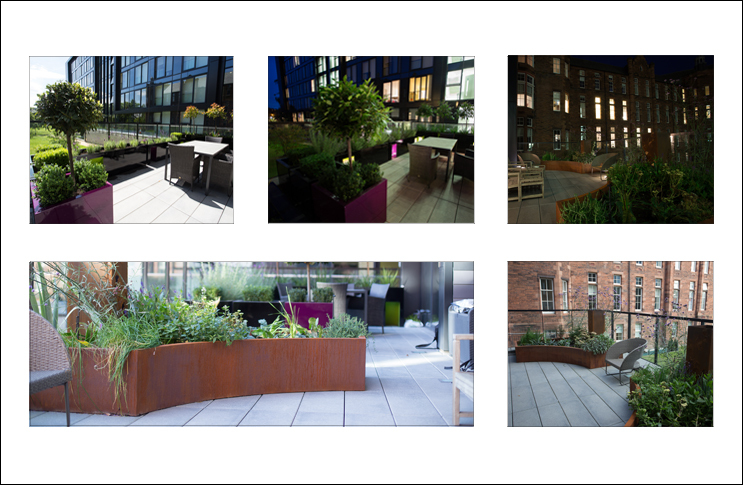 These planting beds were created especially for a balcony in the heart of Edinburgh’s Quartermile district. Twig supplied us with this envisaged idea and our technical team helped to create 3D drawing of the planters in question. These planters were created in our rust (corten steel) finish as creating the planter out of real metal would have caused some real problems as they were to be planted on a small balcony and weight was a real issue. As well as the corten steel planters were asked to create a set of barriers with cut-outs so they could be placed over existing lighting on the balcony structure. The planters were created on time and within the budget set and collected by the Twig Garden Design team who said they loved them as soon as they saw them. Now that the job has been completed we have been given these beautiful photographs to show what the finished planters look like all planted up. The bespoke corten steel planters look magnificently rugged alongside the sharp, modern design of the furniture and surrounding balcony structure. It makes it appear that there is a small rural piece of land on the balcony in the heart of a busy city. The barriers look exquisite at night with the lights shining in the alcoves of the cut-outs, it is amazing what you can achieve with a simple design. We were approached back in April 2011 when we were asked by Kings to look at some designs for innovative large planting beds 5.5m long x 2m wide combining areas for growing vegetables with large tree pits. Originally specified in actual Corte steel, it had been realised that our composite Rust or Corten Steel finish was indistinguishable from the real thing but offered huge advantages in weight saving and, not least, price. Taking the designers concept, we produced full construction drawings using CAD and manufactured bespoke units that although made in one piece actually contained 3 separate planting chambers, two with low floors for the vegetable growing areas and a central one with no floor for the large specimen trees which could then root down directly into the soil below. Production and delivery were all achieved within the timescale and budget and the end result, exactly what the designers had envisaged but at a significant saving to the client and with absolutely no compromise on appearance. 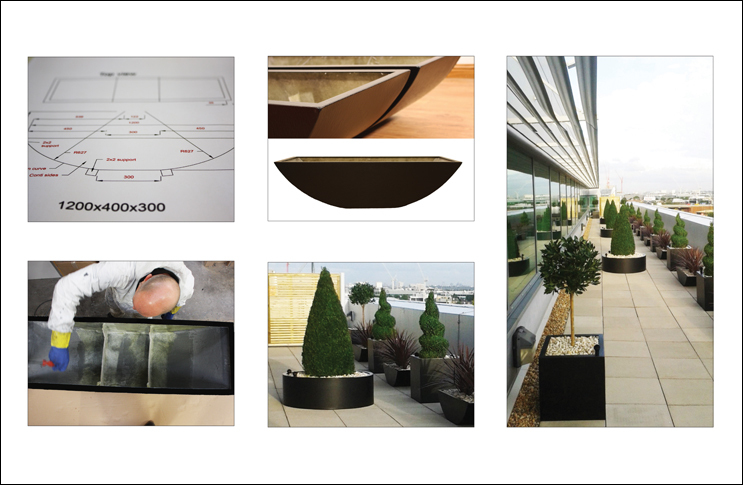 Everyone at Livingreen Design were ecstatic to find out that our customers are once again winners of a prestigious award, with a scheme that incorporates these bespoke advanced composite planters. Designers the Wilson McWilliam Studio were Awarded Large Residential Garden, People’s Choice (Homes & Gardens magazine) and the Grand Award for their Hertfordshire Garden at the Society of Garden Designers Awards on January 24th. It’s a brilliant result for a truly fantastic design; one superbly executed by Landscape contractors, Kings Landscapes. 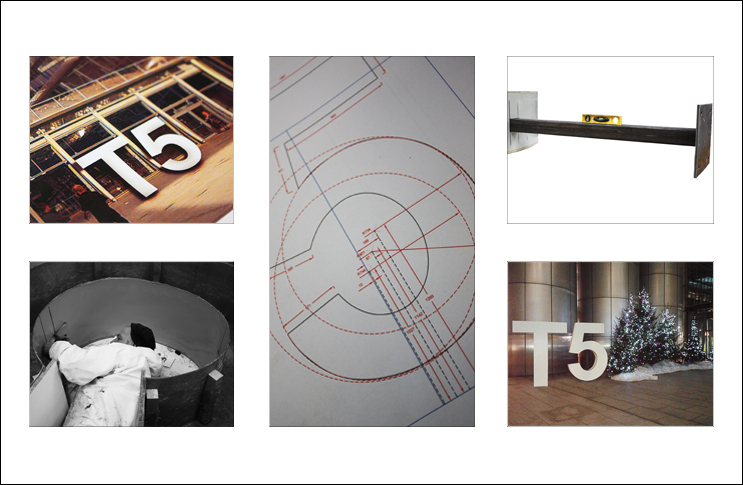 An exciting opportunity to create something impressive for the Terminal 5 building at Heathrow airport, London. We were given a week to create freestanding characters, T and 5, that would be 2.5 metres tall and sit outside in the elements. Our graphics team visualised the concept as the customer was having difficulty, once the concept was agreed out CAD technicians constructed the 3D models and technical drawings required for production. A steel pole structure had to be included in the characters so that they wouldn’t fall over in a high gust of wind. After 90 hours in overtime to meet the deadline they were then textured in our standard Brilliant White finish. Our technical director then drove from Edinburgh to Heathrow to deliver them personally on site at 10pm on a Sunday. A technical challenge for a major insurance company in Paris. The client required large freestanding planter beds that not only had to be irregular curved shapes but also had to fit around fixed pillars and existing drainage points. 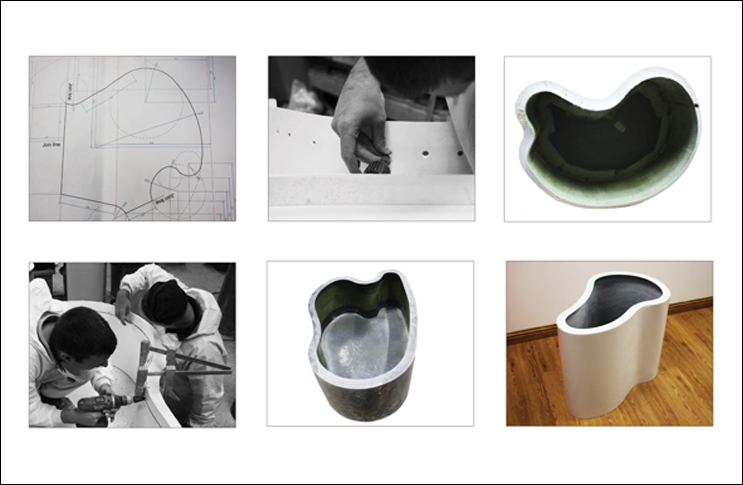 Our CAD technicians drew up designs for 31 different units each requiring a new pattern and mould to be created. The job was completed and delivered within 8 weeks, all finished in high gloss brilliant white. When Duty Calls ... 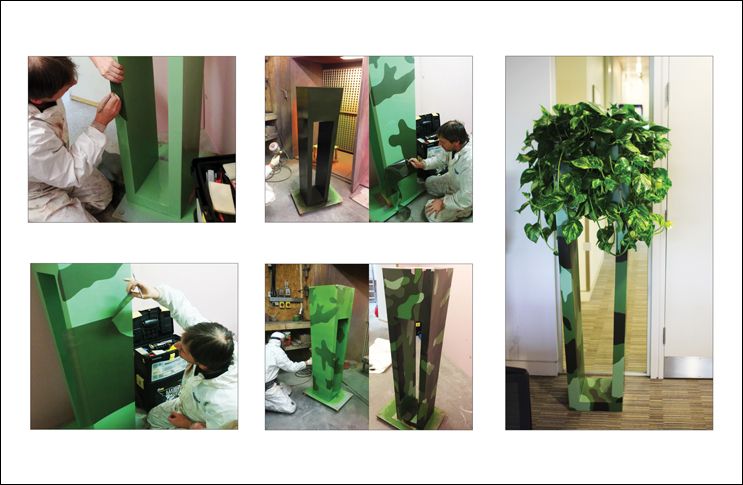 This stunning Camouflage planter was created exclusively for the video games studio responsible for Call of Duty. It was a great opportunity for us to demonstrate our skill at creating bespoke finishes and anyway, our chief painter has done the same to renovated WWII Spitfires, so it was a challenge we couldn't turn down. Using multi-layering and signwriting techniques we created an incredibly detailed, beautiful piece that now greets visitors to the games studio - all it needs now is a gun! 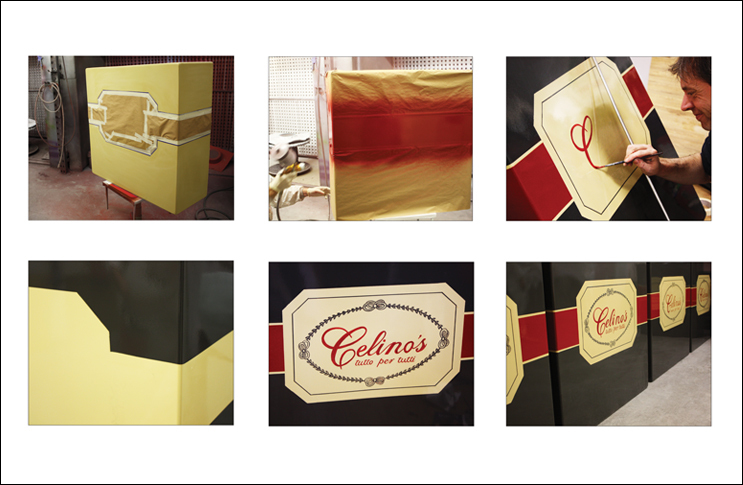 Celino's, an East End Glasgow bistro asked us to create 5 barrier planters with their logo prominent on the side. There was just one stipulation - no vinyl, this had to be done the traditional way, sign written by hand. Fortunately this is our speciality. Three different coats of paint applied before the most delicate stage was upon us. Using great skill and artistry our sign writer was able to complete each logo within 3 hours to the delight of one very satisfied customer. A beautifully designed project featuring specially commissioned boat shaped planters and low circular planting beds, interspersed with 60cm cube planters from our standard range. The client had visitors coming from overseas and wanted the office space to be perfect but there was only two weeks lead time. Undaunted we produced shop drawings, tools and moulds and all the units within the time frame. Finished in textured graphite, the clients love it and say it finished off the office wonderfully. More and more clients are taking advantage of our bespoke lighting service. 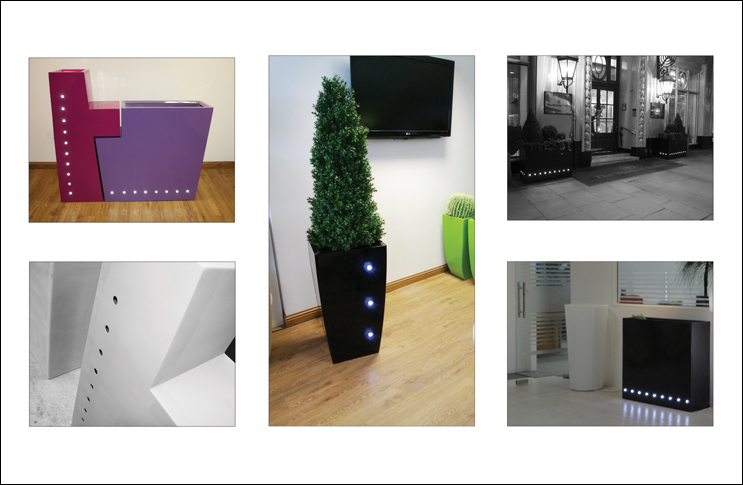 We can fit LED's to any of our flat sided planter ranges, in any quantity and in any design. A few examples of recent projects are shown below, from large barriers, to free standing Kubiks to the highly designed Easter Island Range. Our lighting solutions can be specified for both interior and exterior use and can feature coloured and colour changing lights if desired. Send us your ideas or choose from some of our standard lit ranges.